Rod Abrams Funeral Home Ltd. Mel Maltais - Rod Abrams Funeral Home Ltd.
Thursday March 28, 2019 from 6-8pm, and Friday March 29, 2019 from 1-2pm. Friday March 29, 2019 at 2pm. Peacefully with family by his side, at Matthews House Hospice Alliston, on Sunday March 24, 2019. Mel Maltais at the age of 80 years, has gone to be with his Lord and Saviour Jesus Christ. Mel was a unique person who loved to live life to the fullest. Beloved husband of Christina Maltais. Loving father of Matthew (Rhonda), Ryan (Raquel), Rick, Cindy Payne (Steve), Rodney (Joyce), Sally, and Debbie (Mike). Loving Grandfather. Sadly missed by his furry friend “Beau”. Forever in the hearts of his siblings, extended family, and friends. 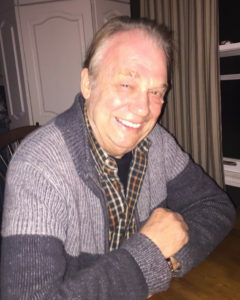 A Celebration of Mel’s life will be held at Rod Abrams Funeral Home 1666 Tottenham Rd., Tottenham 905-936-3477 with visitation on Thursday March 28, 2019 from 6-8pm, and continuing on Friday March 29, 2019 with visitation from 1pm until the time of Memorial Service in the chapel at 2pm. Followed by a reception at the Tottenham Legion. Donations to the Matthews House Hospice Alliston would be appreciated by the family. Matt and Ryan and family, we are deeply sorry to hear of Mel’s passing. He will be greatly missed by so many. Our condolences and prayers. I’m saddened to hear of Mr Mel’s passing. My thoughts and prayers are with you and your family. I will truly miss his voice on the other end of my phone. He was truly one of a kind and wonder soul. Our thoughts and prayers are with your family at this time. Mel will be truly missed here on earth and Joyfully received by His Heavenly Father. We are so sorry for your loss. The Lord has taken yet another wonderful soul into his loving care. Mel was a warm, kind-hearted man. He will be so missed. We think if you take the time to sit and listen quietly you may hear a piano. Rest in Peace dear Mel. Chris, Matt, Rhonda and family. Sincere condolences to you and your family at this difficult time. We were so fortunate to meet Mel when we came to Toronto a few years ago. He was a beautiful gentle soul. Hugs and prayers to the family! Dear Chris and Family..We are thinking about you and your family. Mel was a beautiful soul and will be greatly missed. Sending you love, prayers and strength at this very difficult time. May you RIP Dad. You will be missed by many. Forever to heart and mind. I have never forgotten you. May they have a piano where you have gone, best memories of you with that and song. Sincere condolences to you and your family at this difficult time. I will miss his joyful hello and talks about Newfoundland. May you rest in peace my friend. My thoughts are with you all at this time in your life, i am sure he will be missed by his children Rick Cindy, Rodney Debbie and Sally. Christina, we are sorry for your loss. Our thoughts and prayers for comfort in your family go out to you. I met Mel and Christina at Matthews House while I was there with my husbands great Aunt. Mel and I shared a few great conversations during his stay at MHH, he truly was a wonderful man. My thoughts and prayers to all his family, I believe he is at peace. Dear aunt Chris, Matt and Ryan, I am very sorry for your loss. Mel was a natural leader, a strong and warm man. He was always very kind to me. I remember our last few discussions where I was practicing my French after moving to Montreal and how happy your father was as we talked. I will miss him. My sincerest condolences on the loss of Mel I always enjoyed his visit to the store and chats. He will be remembered. Chris and family, please know that we share in your grief on the passing of Mel. Our condolences to you and all the family members. We met Mel & Chris while Mel was a patient in Matthews House Hospice. We all enjoyed the many chats we had with Mel and also his piano playing. Matt and family. Sorry for your loss Matt. Sadly I didn’t meet your dad. You will be remembered in our prayers. God bless. Every time I see a piano I think of you. Thank you for the “music”.